What are GoGlobal and GoCamp Initiatives? GoGlobal is an initiative of Global Office NGO aimed at promoting language learning and volunteer movement in Ukraine, fostering intercultural dialogue and public diplomacy. Our main mission is initiation and implementation of projects which promote dialogue between Ukraine and the world without barriers, and a creation of conditions for educating a new generation in line with the free world values. Last year we started our biggest project – GoCamp, a new format of language school camps engaging foreign volunteers all over Ukraine. Our aim is to bring up a new generation of comprehensively intelligent and educated youth, who realize themselves as citizens of Ukraine, are ready for the challenges of the 21st century, open to other cultures and for whom knowledge of foreign languages is a common rule. This year we add German and French languages and 4 strands: STEAM, Citizenship, Sport&Health, Leadership&Career. 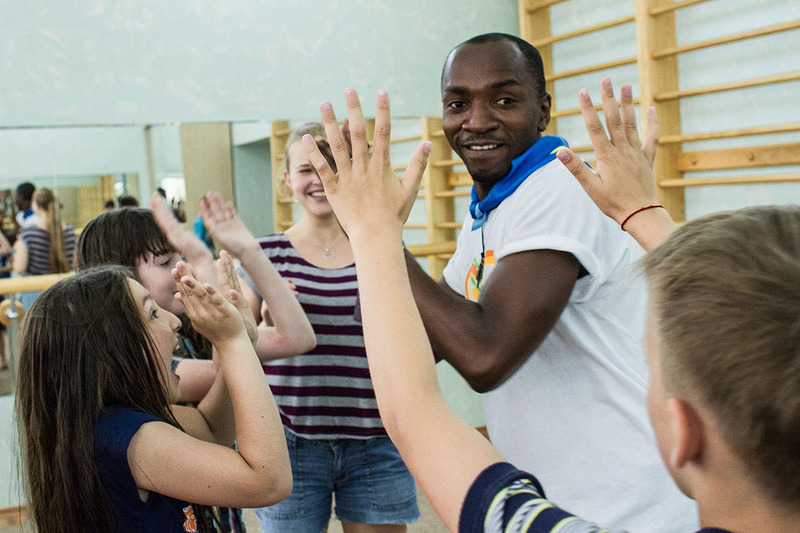 Within three weeks of camp, children from small cities or villages (who have never been to other countries or have never interacted with foreigners) can take part in the implementation of challenging projects and tasks while communicating with foreign volunteers and having fun. Nova Ukraine is partnering with GoGlobal and supports its initiative GoCamp to help educate a new young generation of active and conscious citizens of Ukraine, capable of life-long learning, and prepared for the challenges of the 21st century, fluent in foreign languages and open to other cultures and experiences. 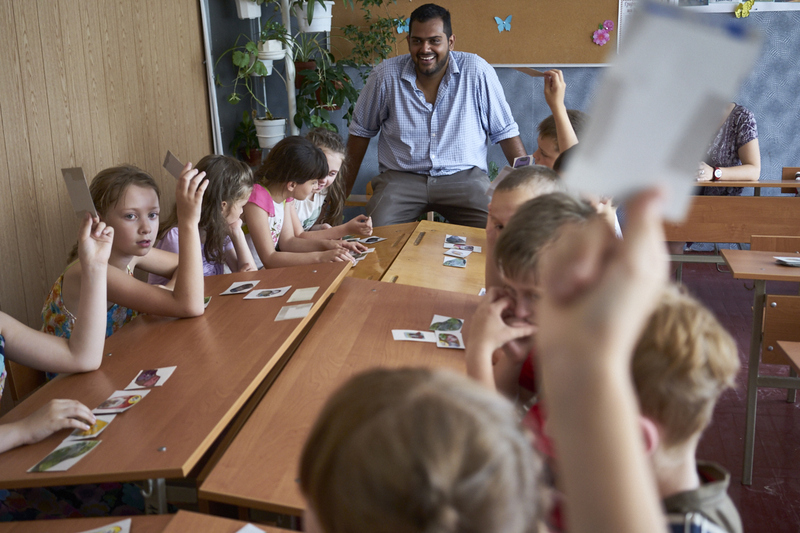 At Nova Ukraine, we believe that by supporting GoCamp we help children learn the essential skills of the modern world: work in teams, communicate in a multicultural environment, think critically, and be tolerant of others. 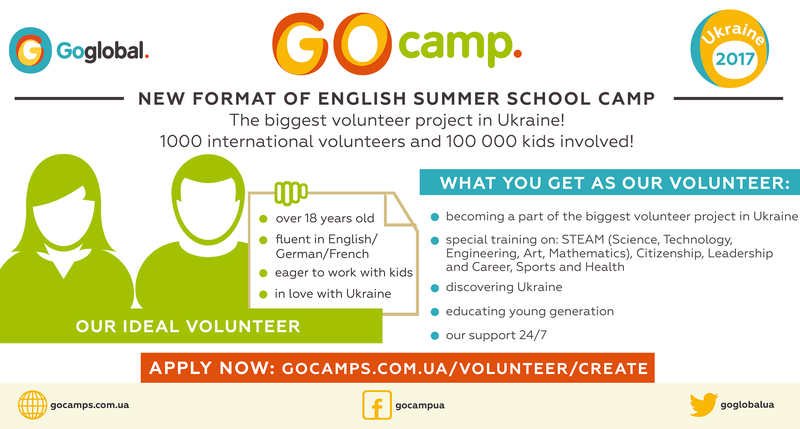 Now the GoCamp project is recruiting English/German/French speaking volunteers who would come to Ukraine and interact with the children in foreign languages, get a great time, new friends and unforgettable experience in summer school camps! Donate: Nova Ukraine is collecting donations to support GoCamp project. It costs 7$ to give one child an opportunity to participate in a project. 70$ can make a real difference in lives of 10 children. Please consider making a donation of any size to our PayPal fund and help us build a strong civil society in Ukraine. Volunteer: Would like to volunteer? You can find more details on how to apply here. You can find answers to frequently asked questions here. Please join to make an impact!